« Who Depoliticized Early Christianity? 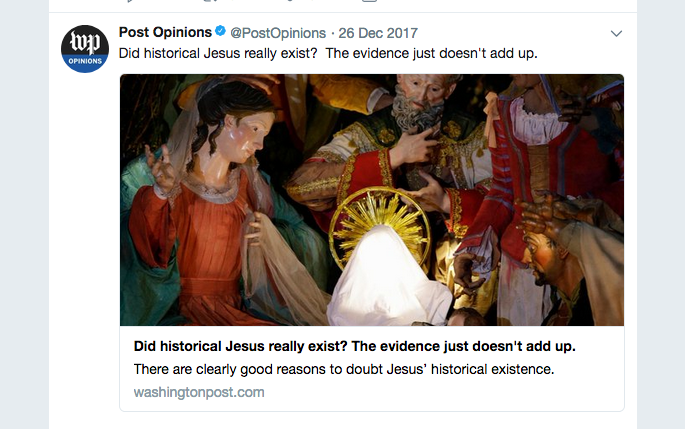 But just to show that the WP really is “balanced” after all, the day before they posted another “shocking” piece arguing how “radical” and “subversive” the story of the magi bringing gifts to Jesus really is. Posted on 2018-01-03 20:24:59 GMT+0000 by Neil Godfrey. This entry was posted in Biblical Studies and tagged Christ Myth Hypothesis, Historical Jesus. Bookmark the permalink. The majority of the world’s population not only demands you see the invisible clothes of the emperor, it demands you see the invisible emperor too. Comment about the cited article, “Why Jesus’ first Christmas gifts were truly shocking” By Diana Butler Bass December 25, 2017. Apparently Diana never really read the gospel stories or if she did, she was thoroughly confused. She wrote, “The wise men secretly fascinated me. I did not know what to make of those mysterious kings from the East — their black and brown faces served as a compelling contrast to our white baby Jesus. They wore regal robes and carried exotic and expensive gifts of gold, frankincense and myrrh for an infant born of peasant parents in a barn. She cannot tell the difference between Matthew and Luke? Actually it is in Matthew that we can read about some unnumbered “magi” or “wise men” (“μάγοι”) who are guided to a house (“οἰκίαν”) and not a barn, by a moving star. Also, only the baby’s mother is mentioned in the episode. I always end up wondering why it was that AMatthew found it necessary to have the members of the holy priesthood of the peoples of the Parthian empire to the east, following a miraculous star (for magi priests were astronomers and astrologers), especially since the powers that be in Judea were marshalling forces to utterly destroy the babe. I suspect it has something to do with the prior ‘savior’ of the Israelites….Cyrus, who had brought their captivity to an end and sponsored the building of the Second Temple in Jerusalem. Of course, it also does not hurt that those with the best reputation for foresight in the ancient world – magi – foretold the greatness of the babe. Maybe the Magi are post-shadowing, an attempt to link the new christism cult and the older Parthianoid religion of Mithra. 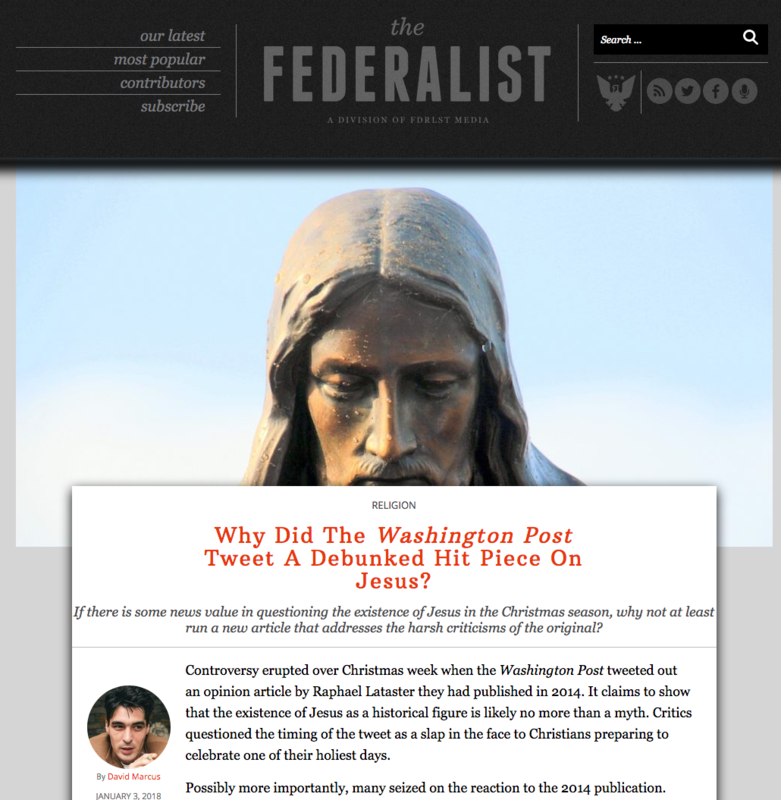 I’m not sure that “The Federalist” isn’t a Russian media plant, to be honest. I just read the “debunking”. It was embarrassingly bad. I suspect that for many historicists, they are so convinced they are right they feel they do t need to bother with actual arguments, just throw out a few “nuh uhs” and claim victory, without pausing to consider if their “refutation “ was addressed in the article they are pretending to respond to.